UK kit and specialty car builder Ginetta has apparently weathered a storm of corporate upheaval and come to rest under the aegis of motorsports engineering firm LNT Automotive. Does that mean the company's doomed to shadow its parent? Not quite, the company says. It released images of what will likely be the company's new GT car. 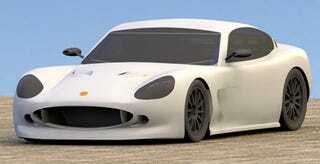 Due in 2008, the lightweight Ginetta G50 will be powered by a 3.5-liter Ford V6 — front-mid mounted — over a five-speed sequential gearbox. The company's also creating a Cup car to give GT drivers a low-cost way to the track. What price? Figure £35,000 in the UK. Ginetta is to launch an all-new British sports car for 2008, designated the Ginetta G50, the car has been designed in-house at LNT Automotive's new purpose-built factory in Leeds. The G50 is a celebration of 50 years of British sports car manufacturing by the company, and has been designed as the base for a new generation of Ginetta sports cars. 2008 and will see the Ginetta 'G50 Cup Car' launched, this car is designed to bridge the gap between single-make sports car racing such as the current Ginetta G20 championship - and GT cars such as the new GT4 Championship, GT3 and GT2 racing. Weighing in at a little over 800kg, the Ginetta G50 is a rear-wheel drive car, powered by a front-mid mounted Ford 3.5- litre, V6 engine producing 300 bhp, with a five-speed sequential gearbox. A G50 Cup Car series will be created, with the focus on keeping running costs to a minimum by using control tyres, control fuel and low maintenance costs through clever design. Ginetta will offer a spares and support service at all race and test events. The series will consist of 10 race weekends, with eight events confirmed to be supporting the SRO F3/GT package alongside the current 'G20' Texaco Havoline Ginetta Championship. Two stand alone, long distance events are also planned with a substantial prize fund and TV coverage guaranteed by Ginetta. Lawrence Tomlinson, Chairman of LNT Automotive said: "We've designed the G50 as a stepping stone for GT drivers. Production of the first 30 cars is well under way with a mixture of cup, road and GT4 cars available from early 2008." The price is likely to be around the £35,000 mark. Further news and details will be announced over the coming months as the race car design is completed and goes into full time production.